I’ve been making my own beauty products for some time now. To be honest, I didn’t use very many products to begin with, but now that I’ve rocked it homemade, I’m never going back. 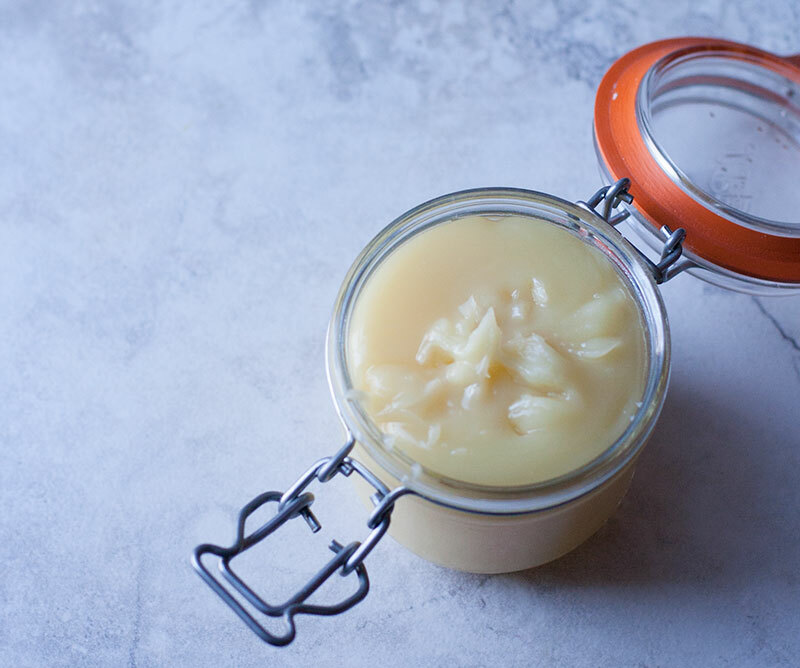 Not only are homemade products economical, customizable and easy to make, you can also skip all the chemicals present in many store bought products. If you’ve been in the health conscience community for any length of time you’ve probably heard of the shocking amount of chemicals the average person applies to their body each day in the form of personal care products: On average 9 products per day (men and women) containing approximately 126 unique ingredients. What’s more, 25% percent of women apply a whopping 15 or more products per day. Our skin is the largest organ of the body, our barrier to the outside world. But we often forget that products can and do penetrate the skin. If you can’t eat it, you shouldn’t be putting it on your skin! Not to worry though, because the American government rigorously tests the safety of the ingredients in these products, right? Well, actually no. There are no studies or premarket testing required for healthcare products. To make matters worse, most people are using a variety of products. Even if the manufacturer tests the product for safety there is no way to test for interactions with other products. Use less. Do you really need all that make-up, eye cream, deodorant, perfume, cologne, mouthwash, body wash, face wash, shampoo, conditioner, hairspray, etc. etc. etc. anyway? Hey, you’re beautiful just the way you are! Added bonus: imagine all the extra time you’ll have to do the things you really love, instead of applying all those products. Glow from the inside out. Natural, healthy skin is beautiful and vibrant all on it’s own. Take care of your insides and you’ll be glowing on the outside. Think staying well hydrated; reducing stress; getting enough sleep and exercise; and eating plenty of fresh leafy greens. Check the safety of the products you’re using. The Environmental Working Group Skip Deep database is a great resource to see how your current products stack up and find better ones that suit your needs. Know what you’re putting on you skin! Make your own. The best products are the ones you make in your own kitchen, suited to your needs (and edible). Remember – if you can’t eat it you shouldn’t be putting it on your skin! 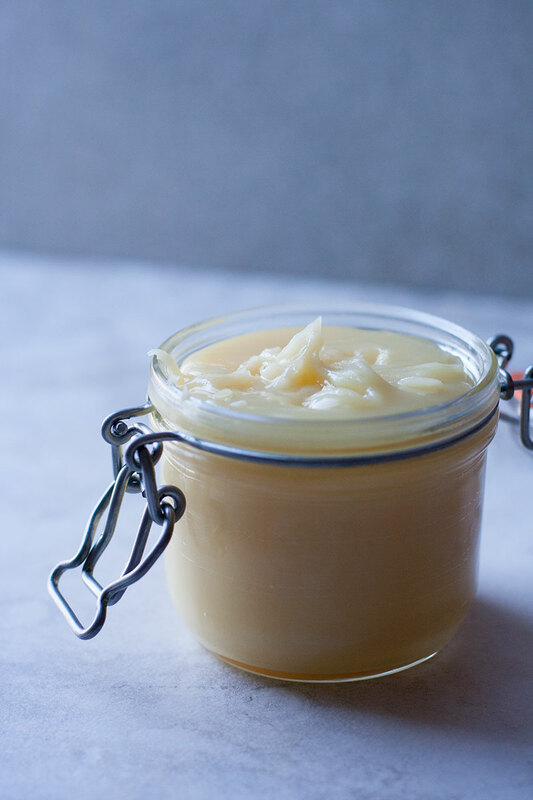 This homemade chocolate coconut body butter definitely fits the bill. There are just 4 simple ingredients, easy preparation and long lasting deliciously silky skin. It’s perfect for dry winter weather and doubles as a lip balm too. And you will smell divine! What do you do for naturally glowing skin? What products do you make yourself or would like to learn how to make? Use all organic, food grade ingredients. 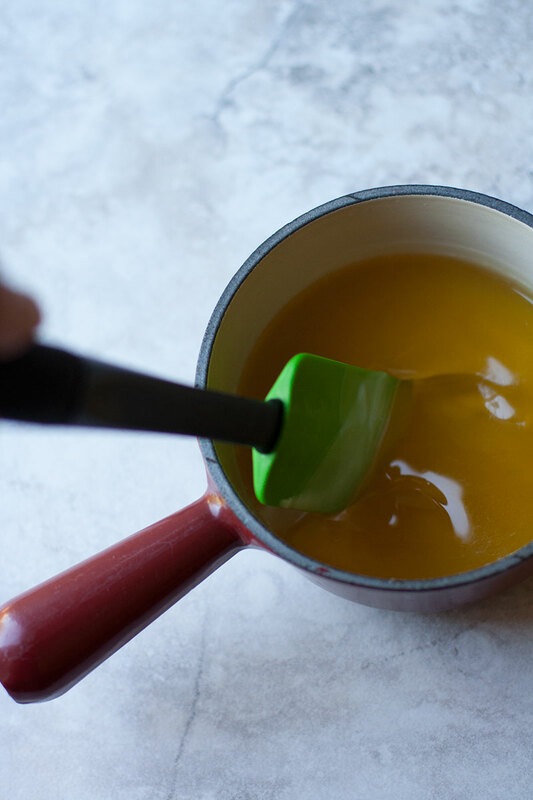 Combine all of the ingredients in a pan over low heat (a double boiler is best), stirring occasionally until the beeswax is completely melted. Remove from heat and stir every 5 minutes or so until the mixture starts to turn opaque. 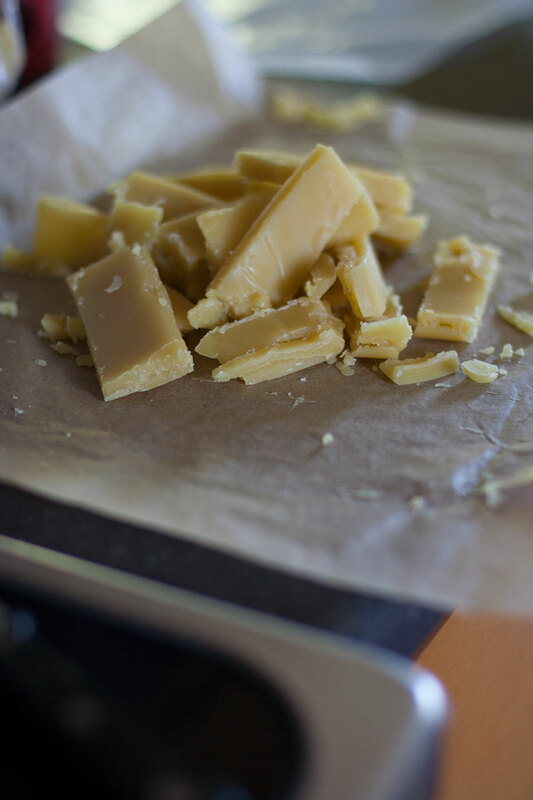 Once the mixture cools enough it will turn opaque pretty quickly as the beeswax and cacao butter solidify. Transfer to a clean jar and enjoy! Use as an allover moisturizer for dry skin. Doubles as a lip balm and cuticle treatment. Skin Deep Cosmetic Database. Environmental Working Group, n.d. Web. 05 Jan. 2016. <http://www.ewg.org/skindeep/2011/04/12/why-this-matters/>. Greeting from Canada! I found your blog through Instagram and I am so glad I did! It’s amazing. I was just curious is this body butter is greasy or readily absorbed? The Canadian winter is taking a toll on my skin and so far no moisturizer I have tried is quenching the dryness. Hey Joanna. The body butter is really rich and can feel greasy if you put on too much at once. Use a small amount and it will soak in well. I’ve been using this recipe all winter to combat the dryness here in Alaska – works wonders!